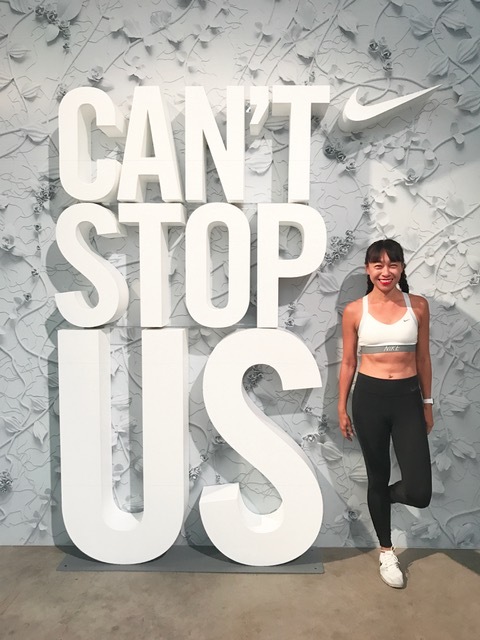 Fitness Swellness: Just Do It – Nike Chicago Marathon featuring ME! A few weeks ago, I was invited by Nike to Chicago to preview their Chicago Marathon gear. Or so I thought. Once I arrived at Just Do It HQ, I did get to check out the gear and I noticed the hair and makeup setup and photo shoot set up but didn’t think twice about it (they often have braid bars and photographers at their pop-ups) but then I was whisked into a chair for hair and makeup. “Do you normally wear your hair back when you run?” the hair person asked. Then I was asked to remove my lipstick. And she asked my level of running experience, whether I was a beginner, intermediate or pro runner. I paused, unsure how to answer. “You’re pro. Anyone who is hesitating is pro,” she said. I laughed and explained that pro makes it sound like I think I’m an elite, which I’m obviously not, but this will be my 12th marathon, I added so I guess that makes me an experienced runner. And asked what this photo shoot was for. And I never really got a straight answer. Something about celebrating women’s achievements as runners and to inspire women to chase their crazy dreams. Sounds great and yet I never understood precisely where and what this photo would be part of, but I just went with the flow. I was soon in front of the camera and the photographer was telling me the goal is to capture all the different emotions you feel as you run a marathon. All sorts of emotions came to mind: exhaustion, happiness, relief, anger, sadness. Fast forward to today, when I’m getting prepared to run the Chicago Marathon on Sunday and there I am on a billboard on Michigan Avenue. Me! The girl who took a Learn to Run clinic in 2007 and now will be racing her 12th marathon. With too many other races to name and a pile of medals at home. I’m one of 100 women training for the Chicago Marathon featured in these ads across the city. I’m still a bit stunned as a type this. I would’ve told you that marathons were insane and there was no way I’d be able to run for hours to complete a ridiculously long distance of 42.2k back in 2007. And yet, here we are! Excited for Sunday! If you’re on Michigan Ave. look for my billboard! 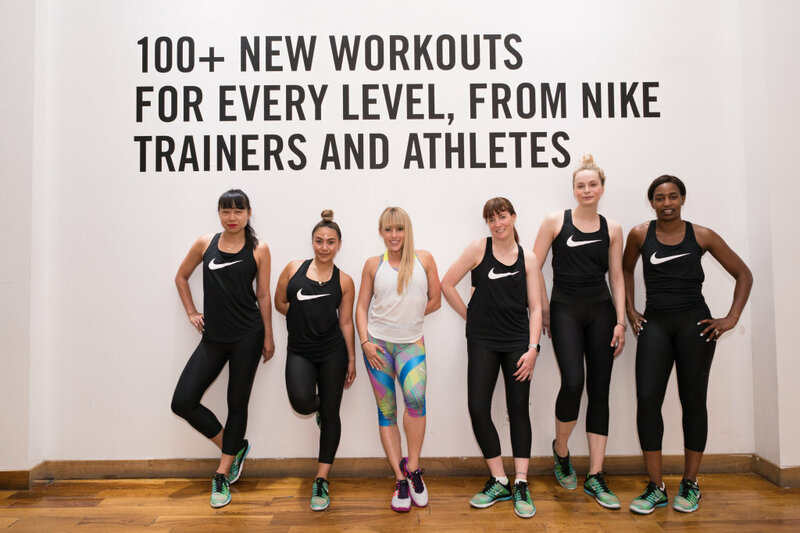 Last weekend, Nike partnered with Sport Chek to bring the Brahaus pop-up to Yorkdale Mall in Toronto. I had a chance to learn about the new bras in the collection and learned that while the sport bras are divided into low-, medium- and high-impact categories (with sports slotted into each one — Pilates would be under light impact and running under high impact), your personal preference and the comfort and support you feel should be what ultimately determines the sport bra you wear. For example, if a medium or even light impact bra feels supportive enough for you for running, you can go ahead and rock that one. Besides actual construction and design elements of the sport bras, the level of elasticity of the fabric content also varies. To more about the new Nike sports bras, check out my post over at iRun; this is the Nike Pro Indy Logo bra I have on here. 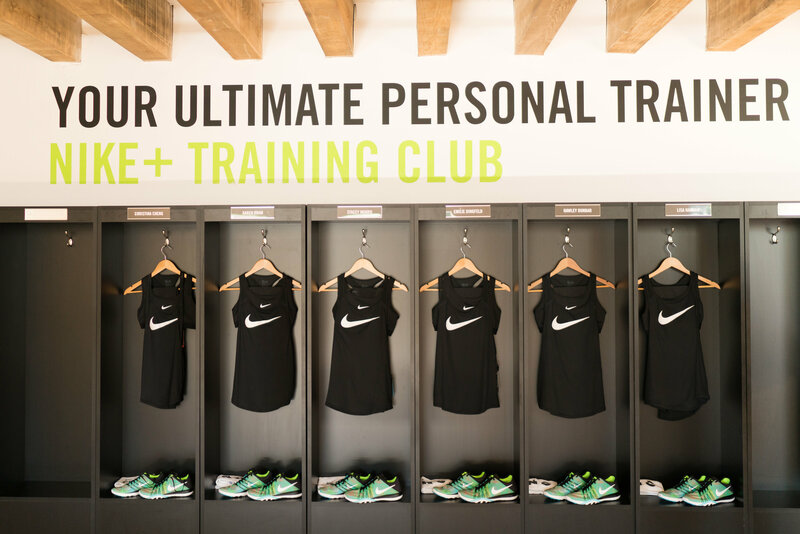 Besides learning about the new bras and the other fun they had planned for the Brahaus, I also sat down with Master Trainer Eva Redpath to talk about my marathon training. To complement my training for Chicago, she recommended I take advantage of the new expanded yoga offering on the NTC app. There are currently nine yoga workouts (Nike consulted with both yogis and three Nike Master Trainers) with more to come and they range from ones that focus on mobility (concentrating on recharging the body), endurance (where the focus is strength and holding poses for a long time, and flows that will build heat and make you sweat) and restorative. Eva knows I have no problem getting my miles in but that I slack on the restorative part of my training. She recommended two of the yoga workouts for me on my non-run days: Deep Restorative Yoga and Ultimate Strength Yoga (which was created by Traci Copeland, a runner herself). Like the other NTC workouts, you get a preview of each movement, and the app is designed so that you can follow along like you would with a yoga teacher in a class by having them lead you through without a visual. One of Eva’s aspects of the yoga workouts is the diaphragmatic breathing (there is at least two minutes of breathing at the beginning of each workout), to help you tap into your central nervous system’s fight or flight response and help manage that; she noted that anxiety could happen mid-race and deep breaths can help me get that response under control. This training season, I’ve upped the frequency of my training, so I’m finding timing pretty limited in my schedule but I hope to incorporate at least one yoga workout a week, so I’m looking forward to trying out these new NTC yoga workouts. Given my limited time in my schedule, I do appreciate the ease of working out at home, with zero commute-to-a-yoga-studio time , and I’ve always found the NTC app to be super well designed and motivating so will soon namaste with Nike. How ’bout you? How’s your training going? “We do?? ?” I meant to mumble this to myself during my Nike+ Training class last week. Nike Master Trainer Eva Redpath had us doing some side squats using resistance bands around our ankles and my quads were burrrrrrning. Except I accidentally said it much louder; I must’ve lost control over how to speak at the volume I wanted to as I was working my muscles into exhaustion. That is how hard this workout was. “YES, we do, Karen!” laughed Eva in reply. 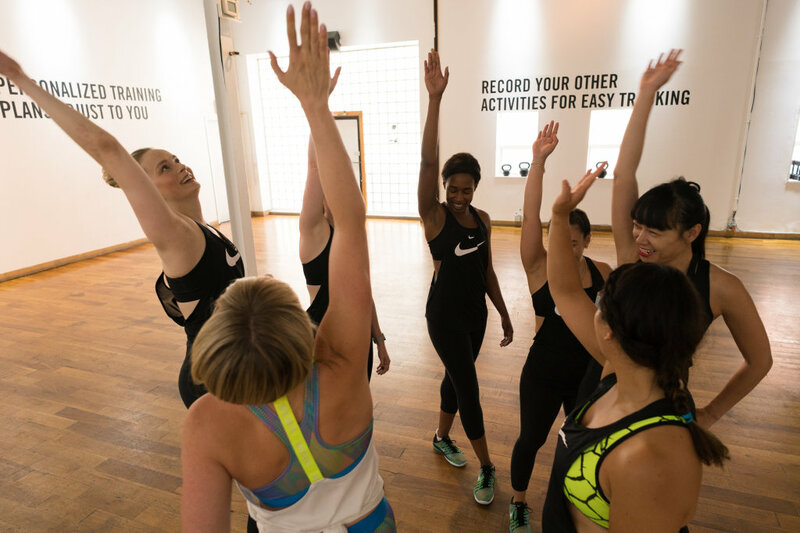 I was one of the first to check out the new Nike+ Training Club platform, which has more than 100 new workouts from trainers and athletes including Skylar Diggins, and yes, Eva Redpath! (Love Eva!) And the app learns how you work out as you use it, so it can better provide you with personalized training plans. The visual cues have been improved as well, so it’s easier to follow along to make sure your form is proper, and there are audio cues (so you don’t have to have your eyes stuck to your smartphone screen). Also new: you can enter your other activities, too, so now all of your fitness can be logged, because most of us do a variety of workouts, after all! Oh, and the boys can now get into the Nike+ Training app, because there are workouts they’ll want to work up a sweat to. It’s not geared to just us ladies, anymore. And does a workout count if you don’t share it? Nope! Haha! And for all you social media fiends, there are new ways to customize your photos to share with friends and community. Yesss, new ways to not-so-humble brag! Tee hee. Or you know, keep yourself accountable (that’s a big reason I share my workouts!). With Eva last week, we did a strength workout, which is perhaps one of my biggest weaknesses when it comes to training. The lightest weight in class: 15 lbs. I generally aim for something about 5 lbs, so my arms were essentially limp noodles after class (I was so pooped that I listlessly dropped the entire sugar packet into my post-NTC coffee!) and it took me about three times as long to walk home because I was just so spent. I’m excited to try out the NTC app in its new and improved format on my own at home. Have you tried it out yet? Thoughts? Any fave new features?